Large print keyboards feature large size letters and numbers in bold contrasting colors for quick and accurate typing. These specialized keyboards provide numbers and letters that are bigger and bolder than a normal computer keyboard. The keys are often larger as well making it easier to see and use. Determine which contrasting colors are best for you. Everyone is different, so there is no color combination that is better than the other. However, a favorite of those with low vision is one that is made by ZoomText. It uses black keys with bright white text for contrast. "Very well made. Worth the money. Don't waste your money on cheaper keyboards. I have Zoomtext software and I am legally blind so this is great because the keys are easier to see and have a nice touch too them." Four times the size of other letters and numbers, this is an inexpensive option to try. "I bought this for my 94 1/2 year old mother for Christmas. 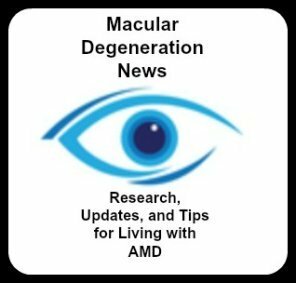 She has macular degeneration and has lots of trouble seeing things. It replaced a lighted keyboard that I got her last Christmas. The keys never felt right on that one and she made many typos. (We also have an LED clip on light on the keyboard for extra visibility). Since installing this one her typing is greatly improved and she hasn't hit the caps lock key by accident once. It has a nice, clicky feel to the keyboard. One of my better choices from Amazon. She has an older XP computer and there was no problem installing it. " Bold black letters on bright white keys is another contrast option. Everyone is different so contrast combinations are a personal preference. "My husband is legally blind. He recommends this keyboard to anyone who need a little visual help using their computer. He is very happy with it." 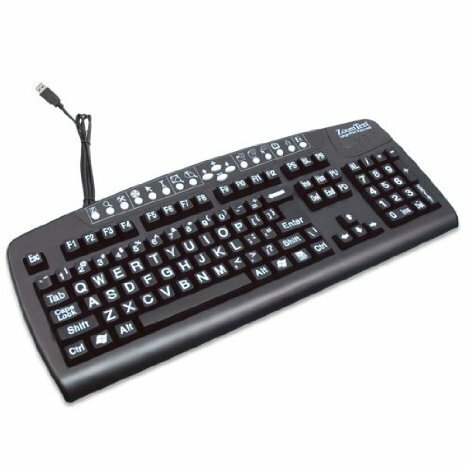 This Large Print Keyboard has been a designed specifically for those with low vision from eye conditions such as macular degeneration, glaucoma, diabetic retinopathy, and cataracts. Using deep black, large letters on a white background provides a stark contrast for better visibility. Each person is different in what contrasting combination works best for them - for some it is white on black and for others it is black on white or yellow on black. This one is not cordless and uses a USB port. A reader shares how this keyboard helps him navigate to his most often used websites. "I use a Microsoft Wireless Laser Keyboard, and wireless mouse Model V 6000 2.0 which comes with a +/- button on the left end of the keyboard which when pressed at the top will magnify your screen to sizes as large as you could ever need, and reduce it back to normal again by pressing the same button on the bottom. I paid $59. for it some few years ago, and it serves me well. In addition, it has many programmable buttons where you can store email addresses, News and weather sites, Face Book page, etc. which greatly cuts down on having to type. Once programmed, you just press that button, and it goes to any of the locations you programmed that button for. You can also change them at any time." Here's a video showing how it works on an older model. For quicker speed and better accuracy a low vision keyboard will aid you in your time on the computer.